A lot phrases concerning performance have connotations of handling or being handled - performers carry a tune, they hold the attention of the audience. I'd never considered the significance of this until last night as Elvis Costello nurtured a collection of songs, moulding them with an ease that belied the complexity of his performance. Accompanied by three spotlights, six guitars and a truly exceptional hat (which only left his head to be lifted in response to applause), he picked from throughout his repertoire, not afraid to mangle crowd favourites along the way. 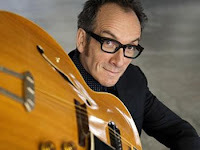 This mangling was most apparent in a violent re-working of 'Watching the Detectives', his first hit back in 1977, which ended in Costello picking out melody lines in the wrong key over a wash of crunching distorted acoustic guitar noise. There was a noticeable shift in the atmosphere, as 2000 middle-aged people heard one of their favourite songs as it might sound covered by Animal Collective. It was brilliant. Most brilliant, however, was 'Slow Drag with Josephine', "how rock 'n' roll sounded in 1921". This trip to the past was provided by ragtime melodies, an un-amplified acoustic, and Costello, freed from the microphone, delivering the lines from the front of the stage. That something of that level of electrifying brilliance was a song from Costello's soon-released new album only highlights quality of his body of work as a whole. Stories of having his Dad in the audience for fathers day, being unknown to American audiences when supporting Bob Dylan, and writing music with Paul McCartney ("that great Mersey-delta Bluesman") all added to the charm, but the most touching moment came with the first song request. As Costello returned for the encore someone in the stalls shouted for 'My Three Sons'. Without saying a word he took a step back, dropped the tuning on his guitar, and played it. This is an example of the connection with the audience that permeated the evening. Costello was a performer not only carrying a tune, but carrying the hearts of everyone in the Symphony Hall with him.